In the first half of the twentieth century, film was in love with the newspapers. Stories of reporters and publishers abounded, not the least being, of course, Citizen Kane, based on William Randolph Hearst. Viewers laughed (rightfully) at a joke concerning radio in Raoul Walsh’s The Roaring Twenties, though the bit really reflected love for the paper. Released in 1940 but taking place in the titular times, star James Cagney is handed a headset for a radio, which is new to him. “Ugh,” he says, while waiting for the broadcaster to speak, “It’s easier to read the paper!” The irony was a treat to viewers in times of widespread success for radio, though papers remained strong. I’d guess the effect was the same as a jest in Cameron Crowe’s Almost Famous. A 1970s Rolling Stone editor revels over a new transfer device that requires extend time to transfer a small amount of text. His excitement makes the technology sound all the more sluggish and nostalgic. Now a new film looks to newspapers long past their heydey. Andrew Rossi’s Page One: Inside the New York Times begins with heavy machinery loading enormous reams of paper, the stuff used less and less in journalism. Rossi wisely begins his film with the clumsy movement of dead vegetation matter. This is how much of the e-universe sees print journalism. But the film sharply turns, to show all the life brought to those mashed trees then delivered to newstands and homes. Page One brings us into the multifaceted system that becomes the strongest and most extensive newspaper we have. Even the most devout readers can’t wrap their heads around al that appears therein. Gay Talese, former reporter and author of the Times history The Power and the Glory (who also makes a brief appearance in the film), has said it takes him over two hours to read that paper each day. Even he – who has much more time than the rest of us – doesn’t get through it. But the paper’s grandeur to many – or missteps to others – isn’t the real issue. The film doesn’t pretend to have a clear answer to the paper’s future. Instead, Rossi depicts the journalistic legacy evolving in the present digital times. 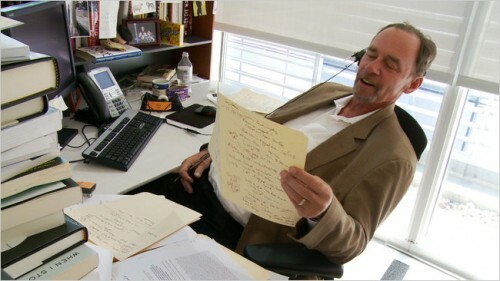 As many reviews have noted, Times media columnist David Carr takes center stage in the film (as opposed to [now former] executive editor Bill Keller and Twitter-loving newbie reporter Brian Stelter). As a writer, Carr looks to the horizon, where print’s end isn’t quite in sight but must be out there somewhere. Rightly, his voice in print is lively, leading a new generation of journalism. In person, he looks hardly like the part. The wear from his well-known crack addiction is in every word he speaks and his appearance. Though Carr stands tall, speaking loudly through his column depicting the state of the Times, other papers, and electronic outlets, and calling out overconfident new media heads. When Carr interviews editors and the publisher of Vice, one puts down the Times. Carr’s tongue-lashing of them is a treat, showing that the grand ol’ institution can swipe away the scurrying little Tweet-ers. Posted in Film Reviews, Side Shots Film Blog and tagged New York Times, Newspapers. Bookmark the permalink. Trackbacks are closed, but you can post a comment.